Here’s a quick little update. I’m doing the Cheesehead Challenge, a race benefitting Dysautonomia International held in Wisconsin (hence the cheese), virtually from home in Virginia. I’d love it if you sponsored me! I have some cool incentives to sponsor, too. If you decide to donate, leave a comment so I can send you your thank you note! I’ll be back soon with some very overly emotional and “AM I RIGHT GUYS” programming. When I turned 26, my dad signed me up for COBRA so I could stay on his insurance for 18 more months until I could either go full time at my current job or find another one with benefits. My birthday was in October, and I still haven’t received my new insurance card or prescription card. It’s been fine, until last week when I went to go pick up some prescriptions on auto-refill. They tried to charge me over $1,000 for a prescription that normally costs me $1.61 for a 90 day supply. I had them hang on to it–I had enough of it at home–and immediately went to my dad, asking him what the hell was going on. Since the incident at CVS, I’d been pushing the anxiety to the side, and Wednesday night it sort of violently erupted like Mount Vesuvius, showering my home and my family with ash and freezing all of us into place. I couldn’t stop crying and hyperventilating. It was my biggest, scariest nightmare realized: did I have health insurance? What would happen if I got in a car accident on my way to my doctor in Baltimore the next day? What about the fact that I needed my Topamax refilled this weekend? Was I going to have to go without my primary anti-depressant? I just couldn’t. I absolutely could not bear the thought of going through withdrawal yet again. Not now. Not again. Not after how hard I’ve worked to get to this point. She never actually said those words, she never fully implied them even, but it’s like there was a Macy’s Thanksgiving Day Parade going around in my head, with big balloon floats all saying “YOU DON’T HAVE INSURANCE” and “YOU’RE SCREWED” and what did it matter what she was saying? At that moment, I was a chronically ill adult and didn’t have health insurance. I was sitting in my car in a parking lot outside a 7-11, and all I could think about was how vulnerable I was to the world. 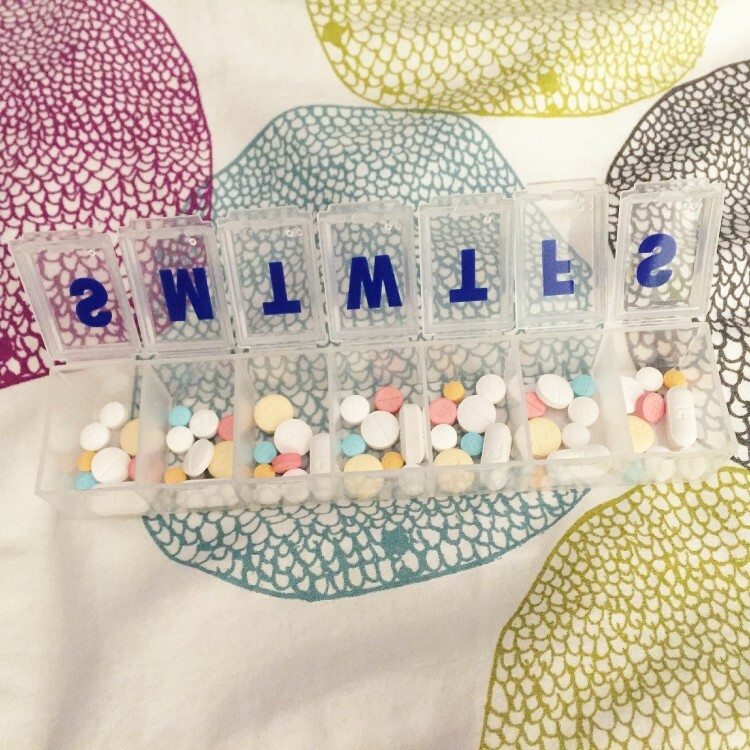 I thought about my pill containers at home, and the limited days supply left of Topamax they held. 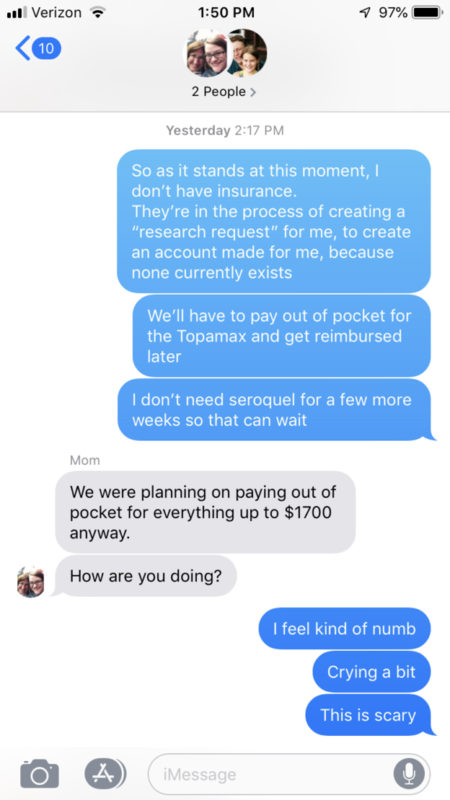 And I read back through my group message with my parents, and felt myself crying, re-reading the message from my mom, that she and my dad had already planned to set aside $1,700 to pay out of pocket for my medication. Dad made another call to a different hotline, and they were able to call my pharmacy and get it worked out that I have prescription coverage. I should be receiving my insurance cards in a week or so. I have no idea what’s to come of the “research investigation” that opened with Victoria today. I don’t really care. My prescriptions are covered, and I’m OK now. The last 24 hours of sheer terror has only further cemented my long held belief that every single person in this world is entitled to access to affordable health care at all times. I can’t find the words for how scary it is to not know if you will be able to afford the medication that allows you to exist and function in the world. I’ve always sort of had this idea of and slow burning fear about losing my health care, and for this 24 hour period, where I really thought it was gone for good, I can tell you that it’s unacceptable that anyone should live this way for any amount of time, ever. To begin with, I was put on COBRA, which is a huge luxury. Next, my dad, while not a practicing lawyer, went to law school, and is well-versed in how to navigate the healthcare system. He knows how to handle these phone calls. He knows how to make sense of what they’re saying. And my parents were willing to pay out of pocket for my prescriptions. My mom said they’d refinance the house if they needed to. My brother even said he’d help out. I also know beyond a shadow of a doubt I could turn to my extended family. I am the definition of privilege. And even wrapped up in this privilege, I experienced the utter terror of what it’s like to live without health insurance, and it’s not something I’d wish on anyone. No one should need a lawyer father and parents who will refinance their house and $2,000 on the side just in case there’s a hiccup in their insurance coverage. We need equal, affordable, quality access to healthcare for all–whether that’s Medicare/Medicaid for all, or another quality solution–I don’t don’t know what’s best. I can’t pretend to. But no one should live like this. P.S., a huge thank you to my parents for being my everything through this. Wowza. I’ve always loved the fall. It’s just a superior season to everything else, because I can finally break out my jeans and hoodies and large assortment of hats. And stop shaving my legs. It’s a good time to be a human being. Sure, season changes mean major pain for POTSies and patients of all forms of dysautonomia, but I think it all balances it out. I’d rather have body aches in the fall than feel pukey in the summer. So, what have I been up to this glorious month? My friends and I spent my birthday weekend having fun dinners, hanging out, and watching our favorite shows. 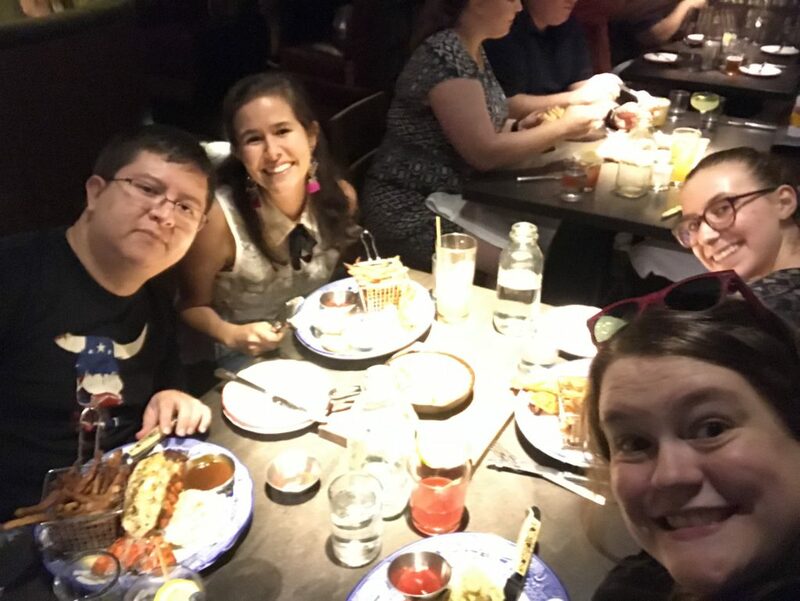 Shira came out from GW and we had a great day catching up, exploring what little there is to explore in Fairfax County, and having an awesome dinner at Founding Farmers in Reston. We also had a family dinner at one of my all time favorite restaurants, Sweetwater Tavern. I’ve gotten the same birthday dinner for the last several years, a filet and crab cake. Please, if you find yourself in Northern Virginia, treat yourself to this meal, because they know what’s up. 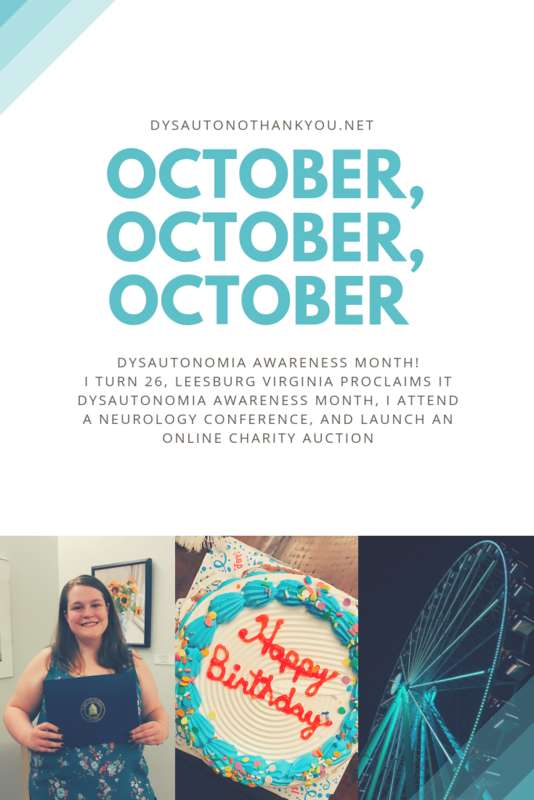 The best part of my birthday (besides spending it with my close friends and people reaching out to me to wish me a good one) was my birthday fundraiser for Dysautonomia International. I did one last year that I was super proud of—I raised $300, and my goal had been $250, $10 for every year I’d been alive. This year I had the same goal, $260, $10 for every year of my life, and my friends and family went above and beyond in every way possible. The fundraiser ended with $801 total, a large part of that from my insanely generous big brother. I’m so humbled by the generosity of my loved ones and the loved ones of my parents who donated—I’m so lucky, and Dysautonomia International is going to use this money for great things. I wanted to make a bunch of turquoise ribbons and bags of candy for an event and had to think of an activity for one of our Monday night get-togethers, so I combined the two. I got to teach everyone about dysautonomia and POTS and put them all to work. It was great–there weren’t many people there that day, but they were receptive. They asked questions. They were surprised when they learned how common it was. And they were so helpful. So, if you’re ever in my position: you’re an activities director with a need to plan something, put your church group to work. 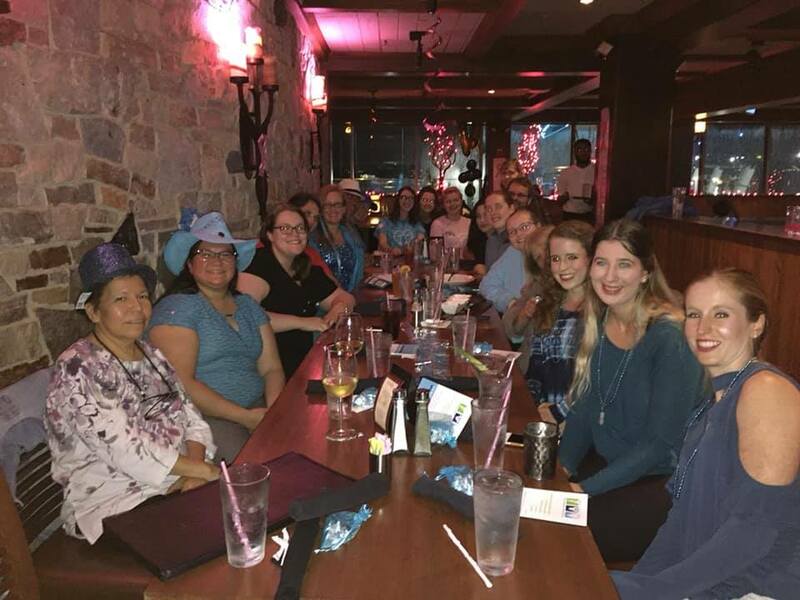 Every year, volunteers for Dysautonomia International across the world reach out to their local government leaders to ask that they declare it Dysautonomia Awareness Month in their respective towns, counties, states. I did the same. 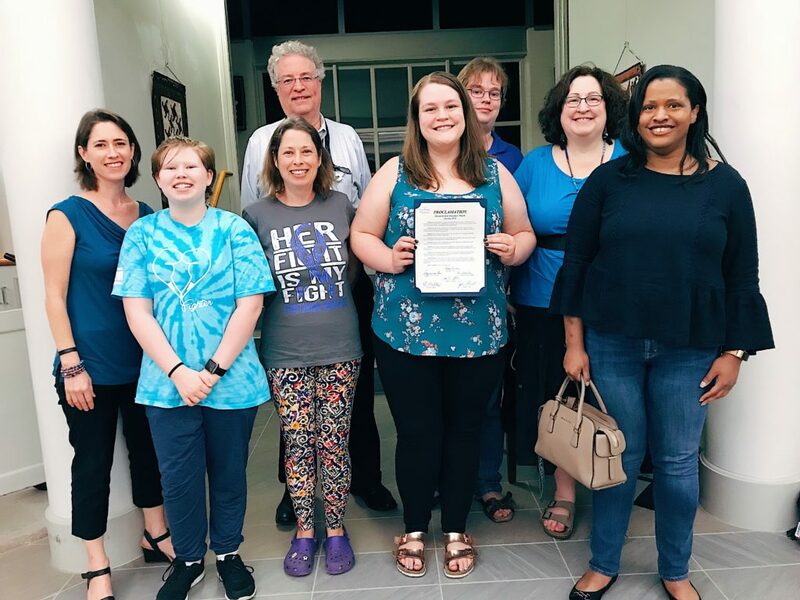 The town council and mayor of Leesburg, VA issued a proclamation declaring it Dysautonomia Awareness month and I got to speak a little bit on why it’s so important that we recognize dysautonomia and its related disorders. 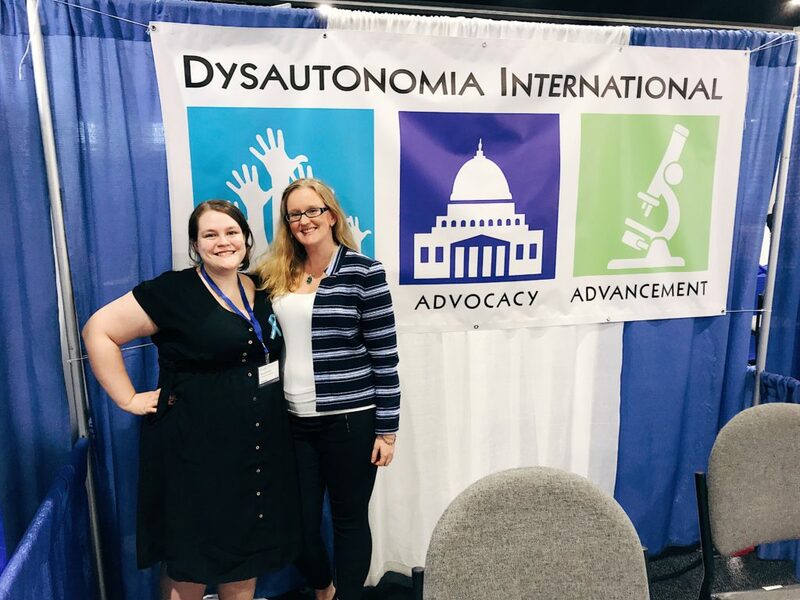 Lauren Stiles, queen/President of Dysautonomia International (and really just queen of dysautonomia in general), invited me to be one of the exhibitors at the American Association of Neuromuscular & Electrodiagnostic Medicine Conference at National Harbor. 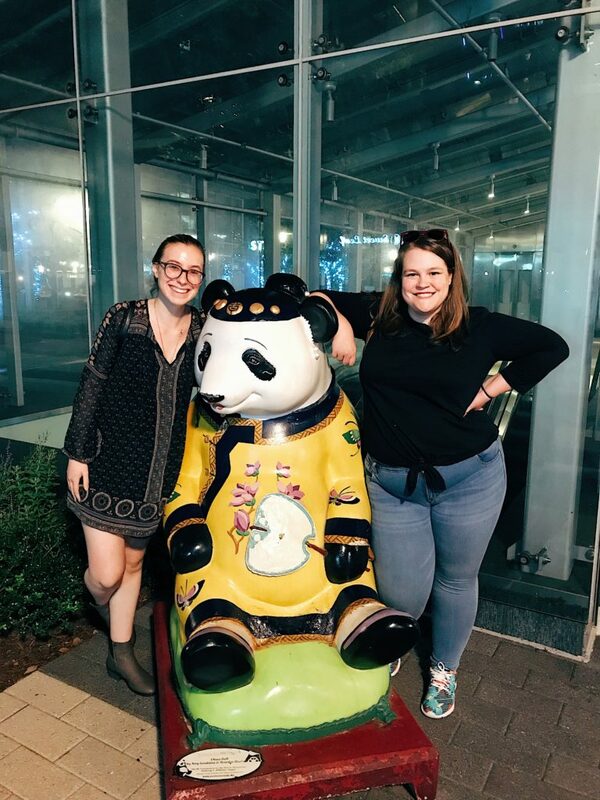 I was excited for the experience, because I love a good conference, and despite living in the DC area, I’d ever been to National Harbor before. It was nerve racking though—while I love talking about dysautonomia and POTS to my friends and people I meet day to day, I’m very nervous when talking to doctors. I was very symptomatic, but I had a great time watching doctors get interested in dysautonomia at the conference. 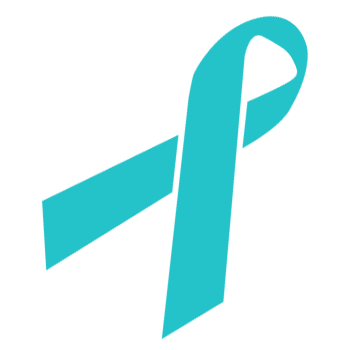 So many of them have dysautonomia patients but don’t have the resources to treat them, and Dysautonomia International is there to help by facilitating physician education programs with those doctors at their hospitals or universities. We lit up the Capital Wheel turquoise! While we were at the AANEM conference, we planned a get together at National Harbor. 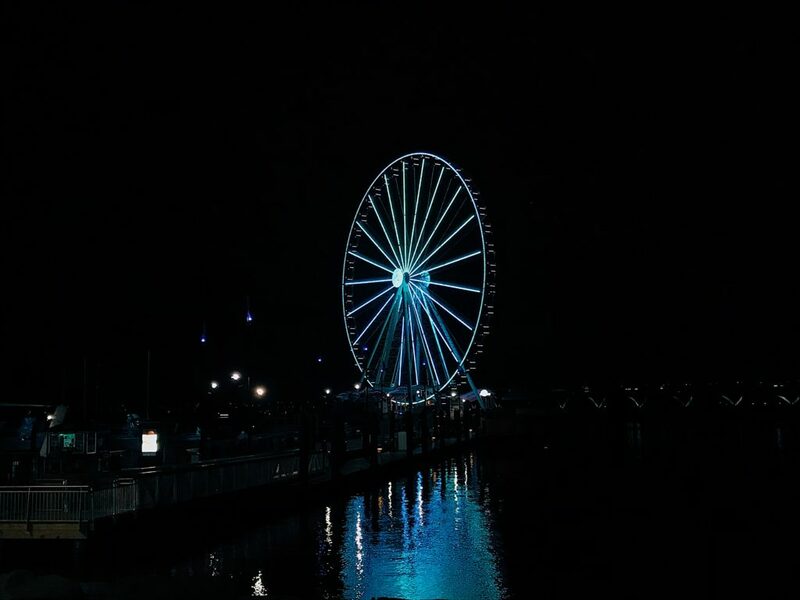 We lit up the Capital Wheel at National Harbor turquoise as a part of Dysautonomia International’s campaign to #ShineaLightonDysautonomia this year and it was STUNNING. The first night of AANEM was the test run for the wheel and Lauren and I rode the wheel which was amazing. It was so beautiful up there—scary, but beautiful—and seeing a monument lit up for your organization and cause is exhilarating. The night of our get together (that we intended to take big group photos with the wheel), had POURING rain, the type of rain where you step outside for two seconds and you’re soaked to the bone. 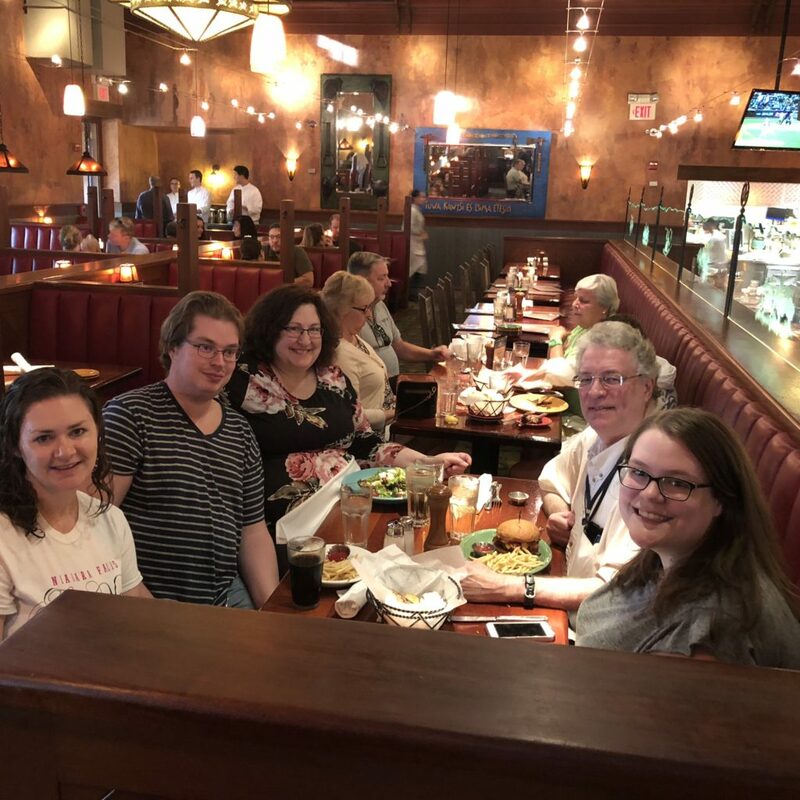 Still, a huge group turned out for dinner and we had a great time getting to know each other, talking about what does and doesn’t work for treatment, lamenting over how awful the barometric pressure changes have been making us feel (season changes are not kind to POTSies! ), and adding salt to our food. 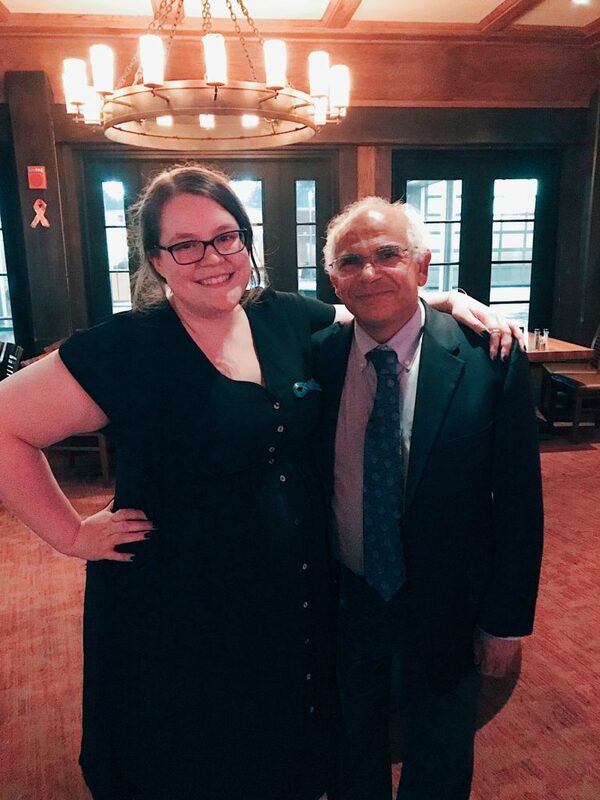 Dr. Abdallah and me! I haven’t seen him in months and I was so excited to tell him how well I’ve been doing. He was so happy and thrilled for me. He’s one of the most compassionate doctors in any field and dysautonomia patients are lucky to call him ours. 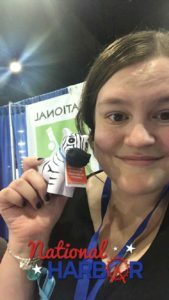 Over the last few months, I’ve been reaching out to independent businesses, online shops, artists, stores owners with connections to dysautonomia, and asking them to contribute to our online auction. I did this last year and we had great success, and I’m excited to see how it turns out this year! Visit the auction here and bid on items before in closes on November 2! It’s been a great month. Busy. So busy. I love Dysautonomia Awareness Month because everyone rallies together to do their best work to raise awareness in 31 days. For being there. For reading my posts. For celebrating my birth month and my favorite awareness month. It’s been an incredible October. I’ve been trying to get my Hyoscyamine refilled since Thursday. I went to the pharmacy because I was all out and asked for an emergency supply while they called my doctor. Today, I called the pharmacy to ask if they’d heard back from my doctor. I called my doctor. They were on lunch break. I left a message asking them to call in a refill to my pharmacy. They called me back. It’s been a year since I’ve seen them, and so they’re not supposed to give me a refill until I have a check up, but they’ll give me one just this once! So they’ll call the pharmacy, I’ll call the front desk. I call the front desk to make an appointment. There’s a lock on my account from an unpaid balance so I can’t make an appointment until that’s paid. They connect me to the billing department. The billing department answers. They ask for an account number. I don’t have an account number. I explain what’s happening. They tell me that my balance is from an old collections company and the forward me to them. I speak to the next person, her name was Karen. I tell her what’s up and give her my information. She tells me my balance was paid last Saturday. I ask her to call the front desk and tell them that. She keeps me on the line and lets me know it’s done. I call the front desk back and ask for an appointment, so I can get my prescription. They ask me when I’d like to come in. As soon as possible. Do I want to see the doctor, or a PA, they ask. Anyone, I tell them. Just get me in. After several minutes of searching, I’m booked for an appointment tomorrow morning at 10 AM with a PA. I go to the pharmacy an hour later to drop off prescriptions for antibiotics and cough syrup. (I have a cold.) My pharmacist asks me if my gastroenterologist is going to call her back with the prescription. “They didn’t call?” I ask. I’ve written this a hundred times and I can’t seem to get it right. I didn’t think I’d make it here. 26 wasn’t a sure thing in my mind last year, because the dysautonomia and depression were too much last Fall. I couldn’t deal anymore. I still took all of my meds, went to all of my treatments, stayed hydrated, took in my sodium… I did everything the doctors said, but I was just doing it for basic survival, not for longevity. And that’s what made 25 into the most interesting year of my life. But last Spring, I applied for a job, and two days later I had an interview, and the next week I was employed, and I was ecstatic about it. 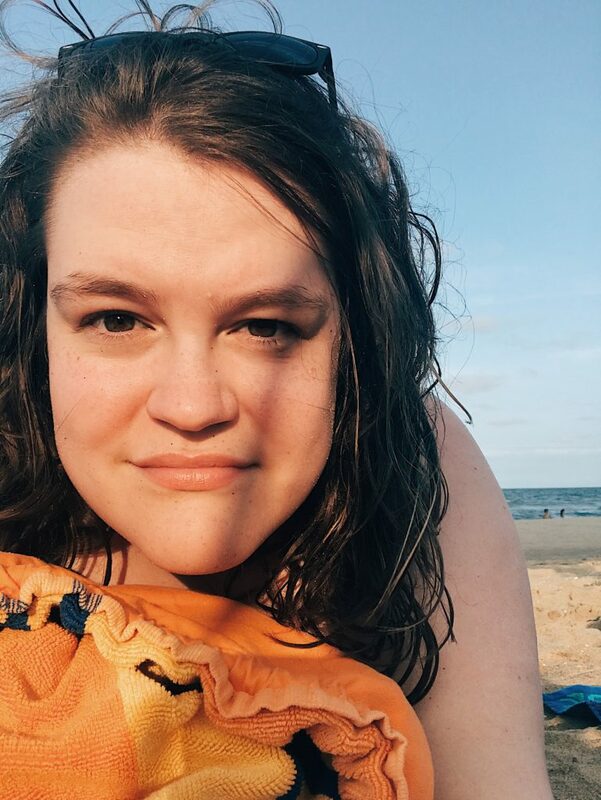 And last Summer, I took two trips, one to Nashville and one to the beach, and loved the feeling of being away from the safety net of my bedroom, a place I rarely left last year. When I was a teenager, I decided that you become an adult when you get your own health insurance or you turn 26, whichever comes first. By teenage Shannon’s standards, I’m officially adult Shannon now. Hey look, Ma, I made it.